The main focus of the Children’s Act 38 of 2005 is that the child’s best interests are put first and foremost in every single case. Divorce is always going to be stressful and highly emotional for all involved – even in amicable separations. In order to stop children from being used as ‘bargaining chips’ when dividing assets, the Children’s Act was created. It gives people under 18 years of age the right to be heard in the argument. 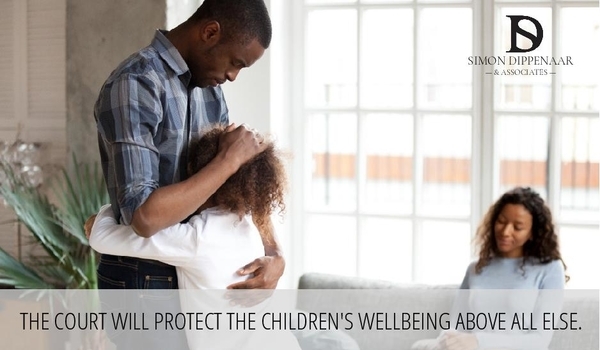 The Children’s Act also gives both parents equal rights in a custody battle, as well as an equal opportunity to show who should become the primary caregiver. What do the courts look at in custody battles? In the event of a divorce, there are several elements that the courts consider when it comes to who will gain custody of the couple’s child or children. No child is allowed to choose the parent they want to live with, however, they do get a say in the matter. The child – When deciding what is best for the child, their personal thoughts are always taken into account. If they have a much stronger bond with one parent or a particular caregiver, this must be explored. Additionally, the age and level of maturity are very seriously considered when asking the child who they would prefer to live with. Other personal traits of the child that are considered include the family background, as well as any disabilities or chronic illnesses. Personal relationships – In order to best determine who should gain custody, the courts will look at the relationship that the child has with both parents and any caregivers who are actively involved in their upbringing. This includes grandparents, aunts and uncles, and sometimes even caregivers who are not members of the family. The court’s aim is to establish how the child relates to these people and who he/she feels the most comfortable with. Attitude of the parents – This relates to their attitude towards rules, responsibilities and parenting in general. The courts consider this aspect in order to ensure that the child ends up with a parent or caregiver who will raise them properly and set a good example for him/her to look up to. Capacity of the parents – The courts look at both financial and practical elements when considering the capacity of each parent to look after the child. This can be related to hours that the parent works and what that would mean in terms of suitable care for the child, as well as the living situation of each parent after they separate. Today, the courts have to put the child’s emotional and physical wellbeing first and foremost. What the parents want has to fall in line with these ideas. Speak to Simon today about how you can ensure your child’s rights are looked after during divorce proceedings. Call on +27 (0) 86 099 5146 or email at sdippenaar@sdlaw.co.za. Simon Dippenaar & Associates Inc., is a law firm in Cape Town, and Gauteng, consisting of specialists family lawyers, and divorce attorneys. This entry was posted in Children's Act and tagged children's act, custody battles. Bookmark the permalink. ← Universal Partnership Agreement – Not getting married? You will need one.